The Family First Prevention Services Act was signed into law as part of the Bipartisan Budget Act of 2018 (H.R. 1892) on February 9, 2018. Included in the act is the Family First Prevention Services Act, which has the potential to dramatically change child welfare systems across the country. This act reforms the federal child welfare financing streams, Title IV-E and Title IV-B of the Social Security Act, to provide services to families who are at risk of entering the child welfare system. Title IV-E funds previously could be used only to help with the costs of foster care maintenance for eligible children; administrative expenses to manage the program; and training for staff, foster parents, and certain private agency staff; adoption assistance; and kinship guardianship assistance. Now states, territories, and tribes with an approved Title IV-E plan have the option to use these funds for prevention services that would allow “candidates for foster care” to stay with their parents or relatives. Go to the National Council of State Legislature (NCSL) for a more in-depth look at the Family First Prevention Services Act. OFCA and the foster, adoptive, birth families and youth alumni voice are part of the Office of Families and Children FFPSA Leadership Advisory Committee. 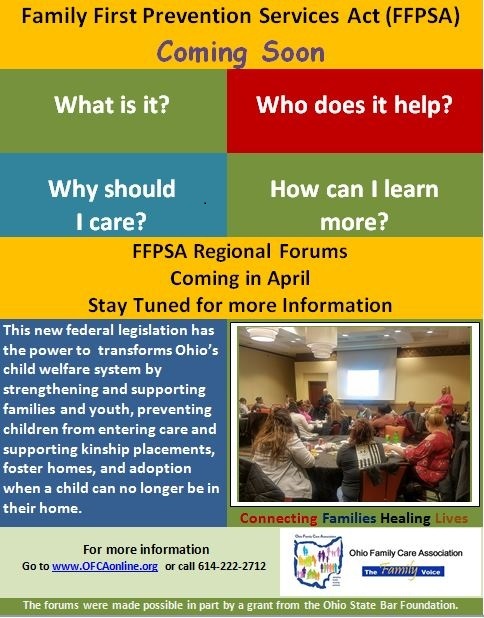 The committee was convened to help guide Ohio’s planning and implementation efforts necessary for the successful fulfillment of the requirements of the Family First Prevention Services Act (FFPSA). Go to the ODJFS Office of Families and Children site to learn more about the work being done.